Cu Chi is a suburban district and about 70 kilometers away from the city center. 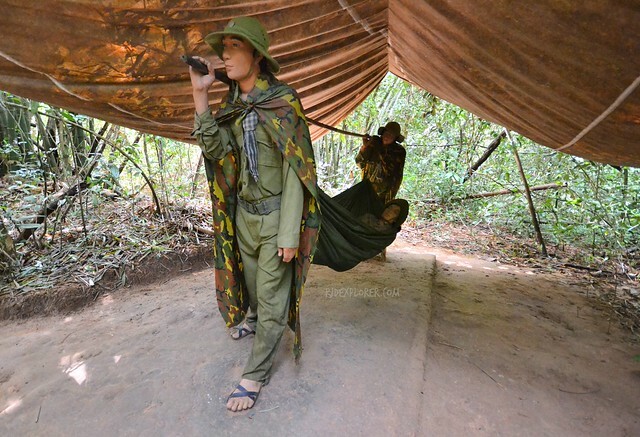 Cu Chi Tunnels is one of the must-visit places for travelers visiting Vietnam. A friend, who traveled to Vietnam prior to my trip, availed a tour package for the attraction. The supposed to be no-hidden-charges tour upset her because the package still excludes the 90,000VND (4USD) entrance fee. With the information I got from her, I decided to do a diy trip to the Cu Chi Tunnels from Pham Ngu Lao. Cu Chi bound bus at Park 23/9. There are buses in Park 23/9 that ply the Ho Chi Minh – Cu Chi route for only 7000VND (0.30USD). Look for the bus numbered with 13 on the right side of the terminal, near the gate where buses depart. Travel time is about an hour and a half but depends on how frequent the driver will pick up passengers along the way. 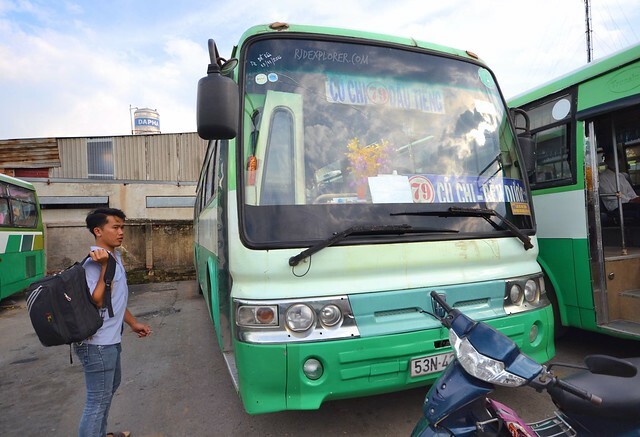 From Cu Chi Bus Station, hop on another bus having the number 79 and route Cu Chi – Dau Tieng. Travel time from the station to the tunnels is about 45 minutes and the fare is 6000VND (0.25USD). 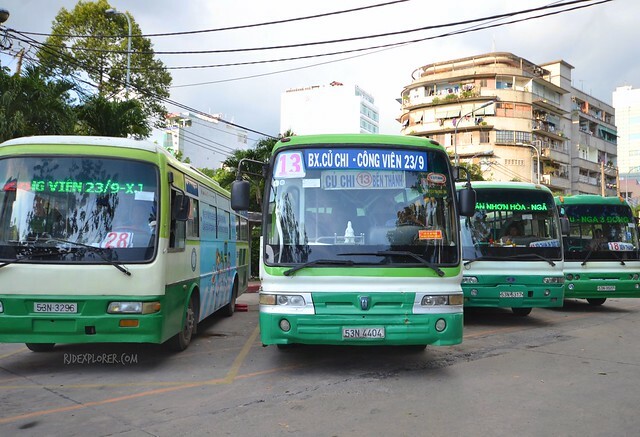 Take bus #94 to Cu Chi Bus Station and from Cu Chi, hop on bus #79 to the tunnels. Fare is cheap yet the air-conditioning system is terrible because I was perspiring for most of the trip. Take bus #79 to Cu Chi Tunnels from Cu Chi Bus Station. Cu Chi has 2 prominent tunnel systems: Ben Douc and Ben Dinh. Ben Dinh is the usual entry of people availing tours from different agencies. And since it was a do-it-yourself style, I accessed the complex via the Ben Douc entrance. 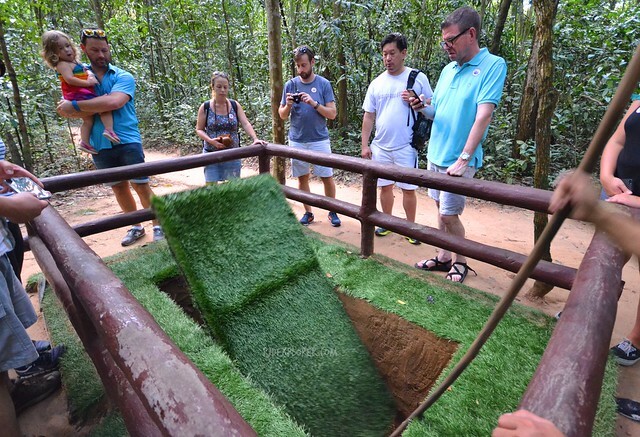 Once the bus attendant noticed that there’s at least one tourist aboard, the destination is automatically Cu Chi Tunnels. So don’t worry about where to get down the bus because they will notify you. To be sure, let the bus attendant know that you’re heading to the tunnels. Welcome to Cu Chi Tunnels. 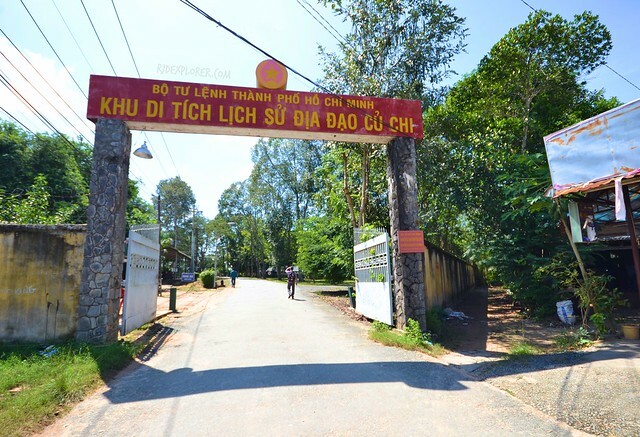 A welcome arch with the Vietnamese words “Khu Di Tich Lich Su Dia Dao Cu Chi”, is evident from the main road. The words translate to ‘District of the Historic Cu Chi Tunnels‘ (is my translation fine?). From the gate, you still need to walk for few meters to get to the ticket booth. 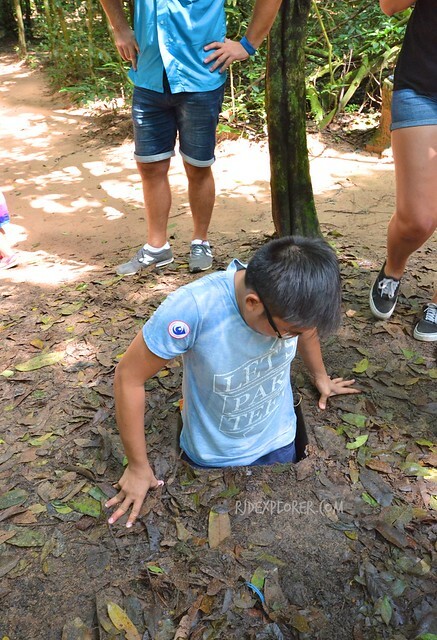 Get Cu Chi Tunnels information guide after you pay the entrance fee. The flyer becomes handy in exploring the destination. I had no idea what to do and where to go because there were no hordes of tourists on sight. With that, I just followed the path and arrived at Ben Duoc Temple of Martyr Memorial. 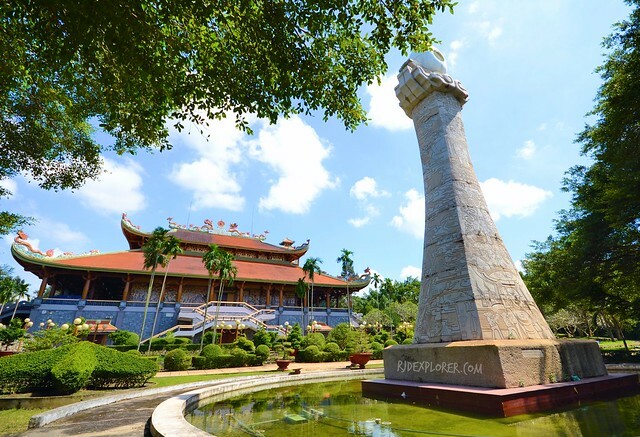 The structure is a historic memorial in Ho Chi Minh City. It has a three-fold gate, a cenotaph house, a 9-storey tower, the main temple, and the Symbol of National Soul. Ben Douc Temple of Martyr Memorial and the Symbol of National Soul. There are also signs along the road and just follow them for you to reach and see the tunnels. When I arrived, staff wearing Vietnamese army uniforms, asked for my ticket to be verified and advised me to wait for a guide. To ensure safety, guests are not allowed to enter the tunnel area themselves. While waiting, you can enter the hall and watch a documentary video about the tunnels. The guides are well-informed in terms of sharing the significant stuff to tourists. Bomb craters, of different circumferences and depths, are everywhere. Pointing out to mounds of soil, similar to an anthill, the guide stated that these are the ventilations of the tunnels. It has tiny openings for air to get into the tunnels. The guide proceeded to pick a cover from the heap of dried leaves. We then realized that it was the entry point to the tunnels. For the enemies not to discover the passages, the constricted pits are covered and stacked with leaves to camouflage on the forest floor. Our guide dared one of the German guys on the group to enter the tunnel on that hole. He just gave instructions on how to navigate the tunnels and head to the exit hole a few meters away. One of the booby traps in the tunnels area. I requested for the instructions to be repeated and asked if I can also go inside the tunnels. A couple volunteered to take my stuff and document my stint. The channels are dark and tight and remembering the directions is the key to surviving it. 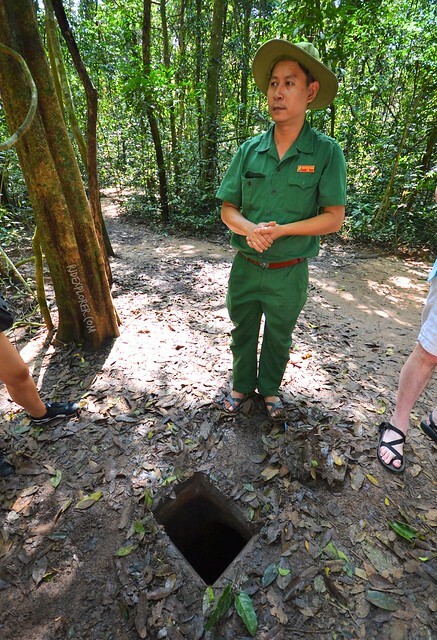 Apart from the tunnels, other things to uncover on your visit to the Cu Chi Tunnels are some booby traps, bunkers used for surgeries, kitchen, and meeting rooms. There are also mannequins everywhere that depict scenarios during the war. If the tight opening is not a good way to enter the tunnels, another network already has stairs going down. But still, you need to dock and fit yourself into the close-fitting spaces for you to get out. The guide again challenged the bold members of the group to try the longest route, which is a 30-meter long passage. I followed and entered the tunnel last. My legs were trembling after I got out of the pit as it requires you to duck and literally walk like a duck to continue with the route. Boiled cassava for a snack. Some of us got muddy so the guide led us to a pipe spurting flowing water to get ourselves cleaned. 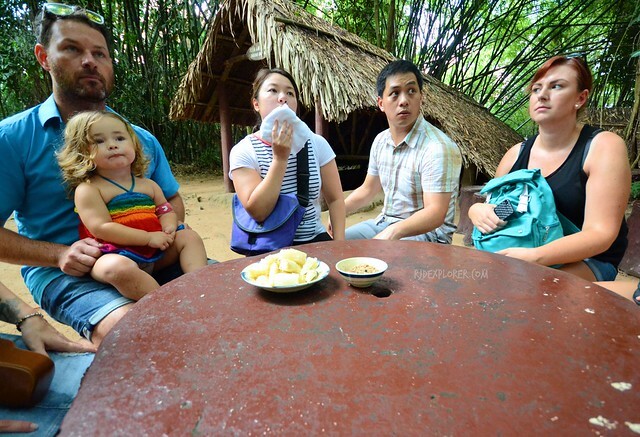 Everyone was asked to sit around the table where a bowl of steamed cassava and brown sugar were served. It was a culmination feast for everyone for surviving the tunnels of Cu Chi. Last stop of the activity is a dugout featuring other booby traps used during the war. Traps like rolling trap, window trap, and sticking trap. Next to it is a building where you can buy souvenirs like shirts, ceramics, and more. The Cu Chi Tunnels experience was really remarkable not only for the rich history that these passages relay but also on how tiring it is to outlast these channels. I went back to the side of the complex to wait for buses bound for Cu Chi Bus Station. Before I hopped on a bus back to Ho Chi Minh, I searched for a food stall near the station when I remembered I haven’t had lunch yet. 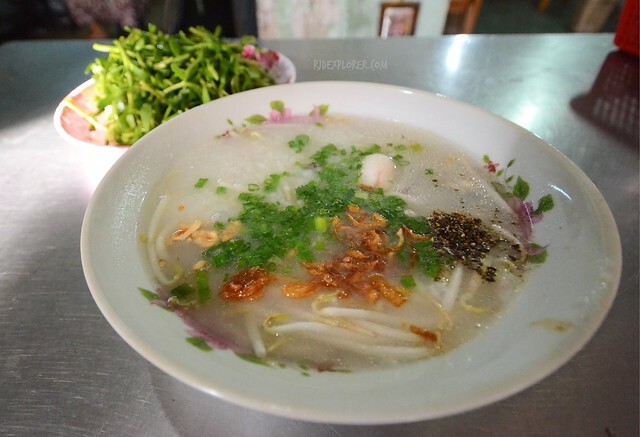 Ordering and getting a bowl of Chao Ca, Vietnamese rice porridge, was a real test because the seller didn’t know how to speak English. 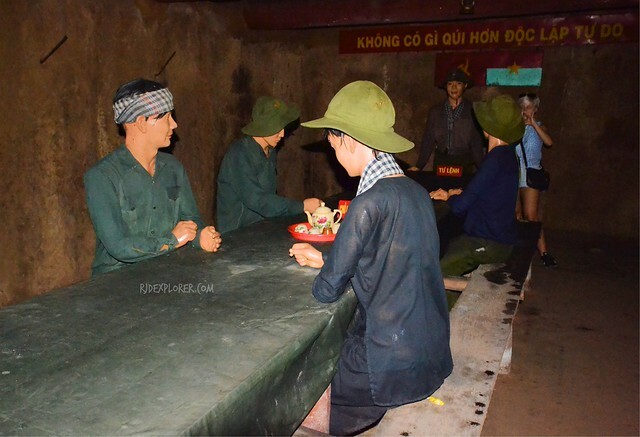 If you’re hesitant for a do-it-yourself trip to the Cu Chi Tunnels, here’s a recommended booking site where you can avail cheap rates to one of the historical attractions of Saigon.